1000 mg of EPA daily. Group 2 received 600 mg of DHA, 400 mg of EPA, and 234 mg of GLA daily. Group 3 received no supplementation. Clinical and laboratory evaluations were conducted at the beginning and end of the study. Results showed the Disease Activity Score 28 (DAS 28 score), and number of tender joints and visual analogue scale (VAS) score decreased notably after supplementation in groups 1 and 2. The combination of n-3 PUFAs and GLA increased GLA, which was undetectable in all groups before the treatments. 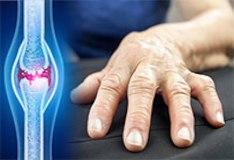 In this study, supplementation with both fish oil and GLA resulted in significantly improved clinical variables, and the consumption of fish oil combined with GLA had positive effects in RA patients which were similar or even better than the fish oil supplementation alone, suggesting the combination has a great potential for patients with RA and other chronic inflammatory diseases.